The two gentlemen that came to our home were very courteous and polite, informative as to what they were doing, and very respectful to our furniture, walls, etc. Professional, courteous, careful, have been satisfied with the service in past. The Service Technicians were fantastic, thank God for them!! Brian, Tom, Carlos and Hugo were a tremendous blessing during this very challenging time with the water damage in my home. I don’t know what I would have done without them!!! Lindsey was very helpful as well. Thanks to all!! Brian and his partner were amazing. Friendly, professional, respectful and careful of my belongings. Truly a great team. I could not be more pleased. Great job. Would not hesitate to use them again. In fact I plan to use them again in the very near future to clean my carpeting. The guys who came out to my house were very professional and very respectful in making sure my house was kept clean throughout all the damage control. A+ work! The workmen were very nice and professional. Prompt, experienced, effective and customer friendly. They were able to work with my odd schedule needs, they were timely, they communicated very well, they stuck to the task at hand and didn’t waste time, they were polite, and explained things very clearly , patiently. They dried the carpets thoroughly! I did not have to worry. I appreciated their attention to detail. The two gentlemen who did our restoration were what I liked best about your services. They worked hard, were efficient, came the same day and completed the job. They were polite and definitely knew what had to be done. Very professional. If all of your teams were as good as these two men, I would have no problem recommending your services. Very professional, efficient and caring crew. Service Team’s timeliness, professionalism and quality of work!!! Very prompt and sympathetic. Oscar and his team have an uncommon devotion to customer satisfaction and quality of work that is not often seen in this day and age. I had my carpet cleaned recently, and it is older, and in need of being replaced. Oscar did an excellent job cleaning it. He was professional, polite, and I was surprised how much better my carpet looked after he was finished cleaning. 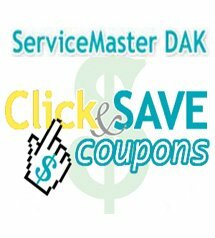 I highly recommend your company, and will definitely use Service Master again in the future. The lead technician we had (he was training someone else that day) was diligent about getting some stubborn stains out of the carpets. Both men who were here were polite and professional. I appreciated that they called me when they were on the way so that I could meet them at my house. The men were very neat and professional. The cleaning was very thorough. My house was covered in plaster dust because of a remodeling project and ServiceMaster really delivered. My house was sparkling clean top to bottom when they finished. Prompt reply to our call and ease of scheduling time and ability to get same service person we have had and liked in past. Great job completed professionally and with great respect and care. Rating: , Review by Ellen L.
We had frozen water pipe that burst in our finished basement. From the moment I called Lindsay on Monday morning, we were treated with promptness, courtesy and professionalism. Carlos and his men were at our home within one hour and explained how they would clean and dry everything, as well as how they would measure and keep track of damage and moisture. Bringing in extra men to move and dry around very heavy exercise equipment, they were very organized and neat, taking saturated ceiling, wallboard and carpeting pieces out in plastic bags. Then they monitored the fans and dehumidifiers and meticulously recorded until everything measured perfectly dry by Thursday morning. The insurance adjuster was very impressed with the speed and excellent quality of work. Our health, safety and understanding were their priorities. I would not wish a home emergency on anyone – but if you find yourself in such a crisis, calling this company will be your best decision forward! The crew was a pleasure to work with. They showed up when they were scheduled to or called if they were stuck in traffic and running late. They worked efficiently and left things as orderly as was possible under the circumstances. The crew chief, Oscar, was always pleasant and was great about communicating with me and returning my calls. Dear Carlos and Crew, I started crying this morning when I woke up and saw that the water had stopped. What a relief! I can’t thank you guys enough for all of your hard work. I felt terrible that you weren’t able to go home to your families after my job and were upstairs. I had peace of mind though, knowing that job would also be done right. I’m lucky that I was sent a crew that not only did their job, but also cared enough to figure out how to solve the problem. You guys are the best! 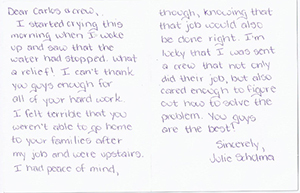 Sincerely, J. S.
The crew was prompt in their arrival, extremely professional and very thorough in their work. Great work ethics! Everything was great. From the responsiveness of the estimator (Jack Knox) in promptly visiting our home to provide a quote and then working to help us meet a tight schedule, to the cleaning team (Carlos, Rafael and Richie) who were prompt, professional, friendly and who did a great job, everything about the team and the experience was excellent. The men were very nice and helpful. They left the house clean and did a very thorough job. This team was very good. They spent a lot of extra time on dirtier spots……….neat as well. We’ll ask for them back. So far, every soiled area appears to be clean. I’ve had my carpet cleaned by various companies; but, I’ve never had a more professional and thorough job done. I’ve wasted my money with Groupons, Sears, etc., and now I’m here to stay with you. I will tell all my friends about Servicemaster in Glenview. You are really fantastic!!! The entire package…from the first phone call until the last broom is pushed, everything was five star. It was a difficult situation and everyone at DAK Enterprises made it so easy on us. The cleaning staff was courteous, caring and excellent. From the office, we were given compassion, courteousy and reassurance that the job would be done to our satisfaction. It exceeded our expectations. We will be forever grateful to DAK Enterprises and will always recommend them to everyone. The job was performed in a professional manner by two gentlemen. They called to confirm our appointment, notified me of anticipated arrival time and worked like beavers to make sure the carpet cleaning in my dad’s house was done to my satisfaction. I became aware of Service Master following flooding in our home a number of years ago. They saved 3 week old playroom carpeting that was underwater and did not leave me a moldy mess to deal with down the road. I have used Service Master in the past and will gladly recommend them to anybody who needs careful, skilled deep cleaning of carpeting, air ducts or water removal. The staff that was sent to work on my dad’s house could not have been more competent or careful! I have been a Service Master customer for a couple of years in a number of your recovery and repair services. On January 4, 2002 after spending a week on vacation my family and I came back to our home in Wilmette just to find the house ruined by water that was coming out a humidifier installed in the attic. On the same Friday the Service Master crew headed by Anthony Butera started the emergency recovery work which lasted a few days. Almost three weeks later I am personally writing to you to express our appreciation and thankfulness for the excellent service and dedication that Anthony has demonstrated towards us throughout the period he worked in our home. His responsiveness to all our questions, his attention to detail as well as his willingness to go the extra mile to recover and save our belongings and our home were just remarkable. The ways he led his team and managed the work are worthy of nothing but praise. I wish every person in the service industry had the approach to operations, customer service, client satisfaction and leadership that Anthony Butera exhibits. Working with him was a pleasure and certainly made our experience way less painful that it would be otherwise. In the spirit of rewarding excellent employees, please accept this thank you note from my husband and me. It is because of people like Anthony that Service Master maintains its high reputation and will keep us as loyal customers. I am writing this letter to acknowledge the excellent work Anthony Butera has been doing in my home after the fire. He has made calls for me when I needed questions answered. He is a very hard worker. He sets an agenda for the day and completes it. My home is always cleaned up when he quits for the day. And he is such a pleasant and polite person. ServiceMaster should be proud to have him on their team. I feel very comfortable having him work in my home. He also has an excellent repoire with your other ServiceMaster employees. Thank you for sending over a person like Anthony. He has turned this nightmare into a positive light for me and my family with his concerns and willingness to get me information when I need it and restoring my house. It has NEVER been this clean. 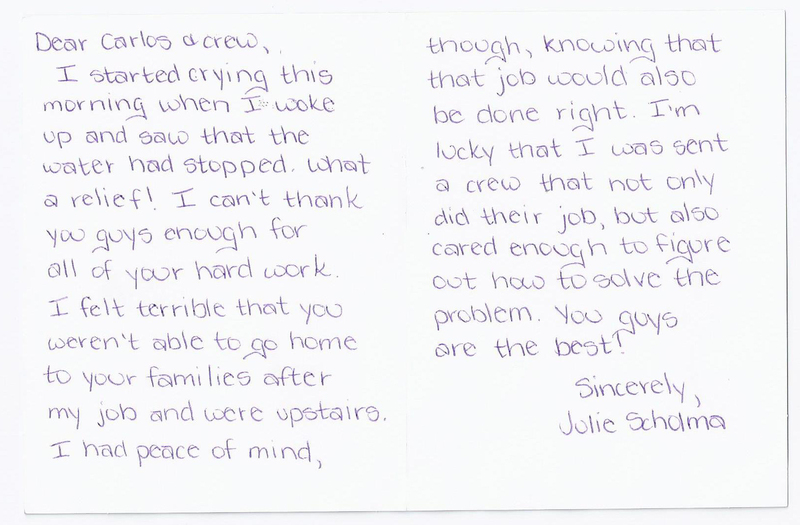 Just wanted to let you know what a terrific job your crew did after the grease fire in our kitchen. Thankfully, all the fire damage is fixable and replaceable-and no one was hurt. But the mess was unbelievable. Mike Knox, Sandro Landa, and Jose Garcia transformed a sooty, oily, smelly mess back into our house in two days. Not only were they very efficient, they were pleasant. Thanks for your prompt service and attention. I would definitely use your services again and recommend them to anyone else who needs them. Crew was prompt, polite and efficient. We are happy with the results. Very satisfied with the technicians knowledge and ability to do a great job, quickly and efficiently. Jesus and Carlos were tremendous! The team you dispatched to our home was tremendous! They worked diligently to solve our problem even though it was their 3rd call of the day and 10pm at night! Great job! Always satisfied-since I started with Dean many years ago. Another spectacular job by Juan and Vincent; I want you to know that these employees exceeded my expectations for their attention to detail, professionalism and courtesy-every year! Keep up the fine work as well as the professional service! Have used your service before and am always satisfied! Excellent service and carpet cleaning results. It was easy to schedule an appointment. Technicians were courteous and efficient. Job was well done. We highly recommend ServiveMaster DAK to family and friends. I have to take the time to commend your cleaning team that was at our townhome on Sunday the 11th. Juan Compos and partner Carlos were sent to our home after the sanitary sewer pipe spewed sewage all over our furnace room which measures 12′ by 12′. They made the best of a bad situation for us. The room was left immaculate and all traces of removal cleaned spotlessly. This crew is an asset to your firm. Thank you, you now have our business, I’ll be asking for this team when you clean our carpets and furniture. 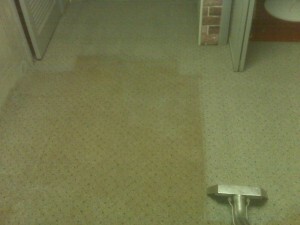 We want to thank you for the crew (lead and helper) you sent August 16, 2011 to clean our carpets. They did a superb job, and were able to remove all stains and discoloration. The lead was knowledgeable and thorough, and respectful of our home. We will not hesitate to recommend your service to others.